Today we have been going down into the robber trenches of different periods. In the main forum south, it looks like Sebastian’s team have located a trench (see above) designed to rob out a lead water pipe – which survives in one portion. This robbing is probably medieval. 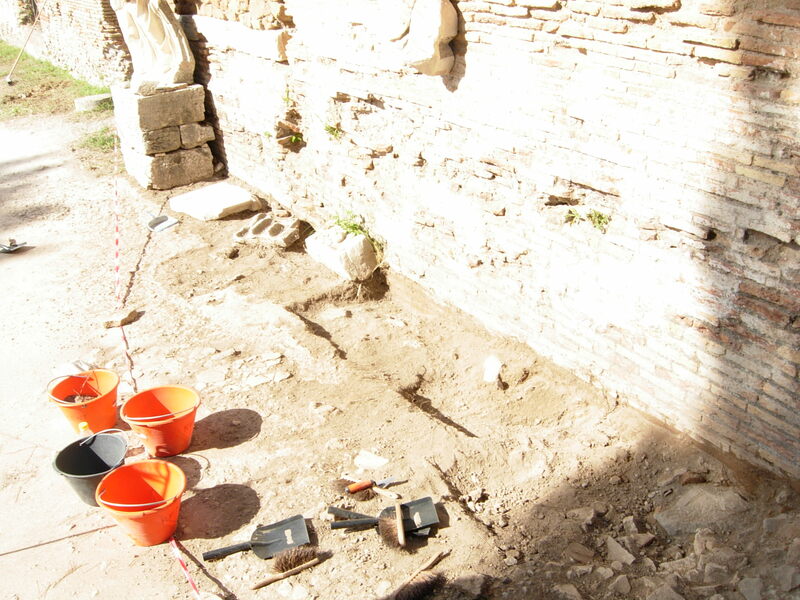 In the macellum, Zsolt’s team have been digging out a former excavation trench around one of the piers of phase 2. We are keen to see what the pier is made out of – one of this sequence of piers contained the remains of the broken heroic statue which has now been re-erected in the centre of the plaza. Perhaps we will find the missing head. More importantly we hope to find a bit of stratigraphy that ties the piers into the rest of the forum’s development. Tomorrow we say goodbye to Christian from the Berlin team with his wonder-helicopter, which has been buzing round the site like swarm of bees. 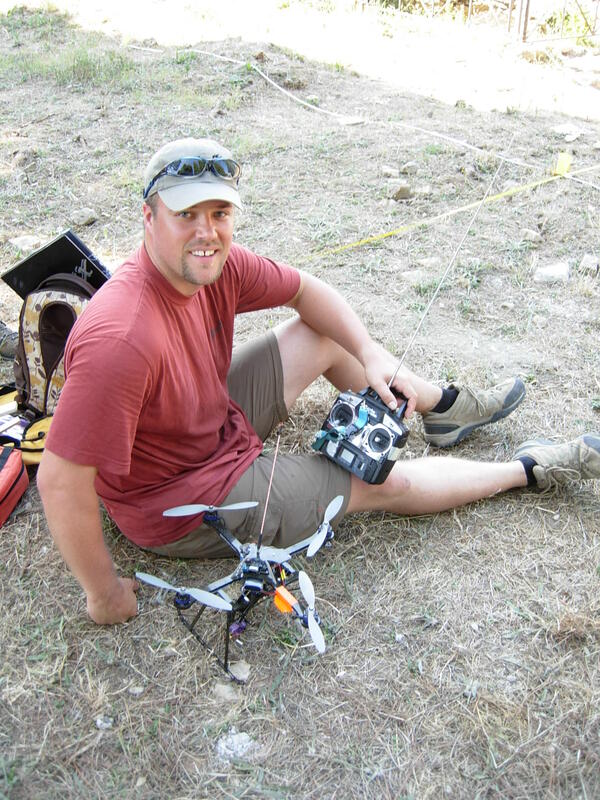 He has produced some great aerial shots with his airborne camera, and we have enjoyed his cheerful demeanor and clear responses to our questions. Perhaps Kent will be able to get such a device in the near future. More progress is being made in finds – we located last year’s material in the depot (which is closed until September), and have also been able to process the first finds. These have been a mixture of ancient and modern materials – indicating contaminated layers. These come from the forum where we have had a big job to do sorting old excavation dumps and tourist rubbish deposits from real archaeology. 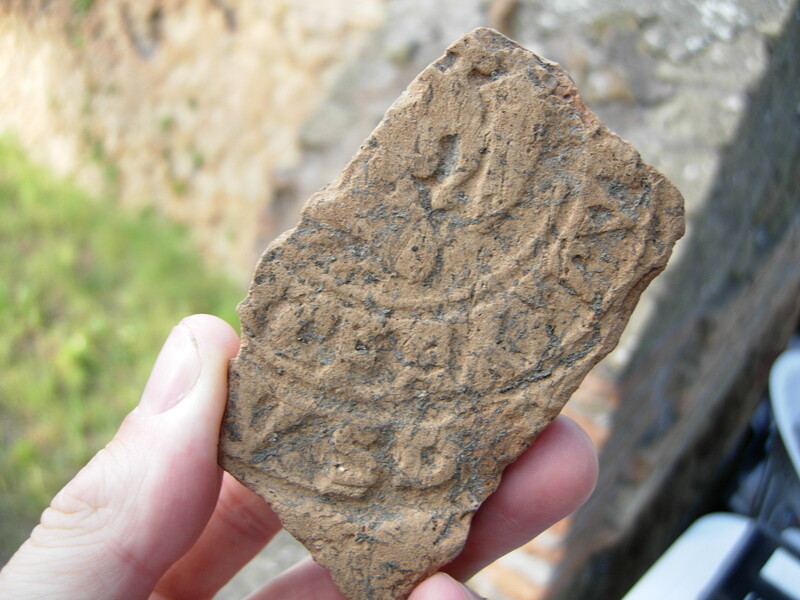 However some good finds still turn up – such as this brick stamp which came out in the finds washing.